If you are out riding the trails for any length of time it’s important to have a few things along in case you need something or get into a bit of trouble. A few things we always take along are a First Aid Kit, a Tow Strap, Rain Gear, Large Tarp & Bungee Cords, a Tool Bag, Cooler, Water and a few other things like a chair to sit on when you have lunch. It’s good to have somewhere to stash all this gear. When we first started riding ATV’s in 2008 we bought some Trail Bags to put on our machines. They worked good and kept our gear pretty clean and dry. 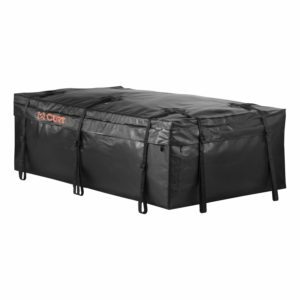 If you have an ATV and don’t have a trail bag you may want to consider getting one. When we bought our Side by Side with the utility bed it meant that we could take more gear, right? So we bought a bigger trail bag and added some folding camp chairs to sit on when we stopped for lunch. However, folding camp chairs didn’t exactly fit in our trail bag. So we wrapped everything up like a birthday present in a plastic tarp, secured it with bungee cords and threw a cargo net over the bundle. That worked okay. The down side was that when you unwrapped everything to get the chairs and the lunch out, BAM! @#, dust went all over everything. And if it rained at all it got damp inside the tarp. 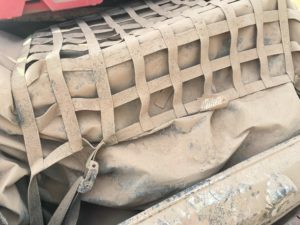 And a side by side with a utility bed really accumulates dust inside the bed and doesn’t blow off like it does on an ATV. Now you might me thinking. “So what’s the big deal? You’re ATVing and its dirty out there.” And you are right, but when I get home I would much rather clean one thing (the cargo bag) instead of the 20 things that are inside. But that’s just me. This bag is 59” wide, 34” deep and 18” high. It’s big enough to fill the utility bed on my side by side and spacious enough to put a lot of gear in it. It has 21 cubic feet of storage capacity. It has welded seams, a heavy duty zipper and a fold down lip with Velcro connectors to keep it down. It’s made from thick 500 x 500 denier, UV-resistant vinyl. Now that being said your needs may be different than mine. I’m kind of a “Being Prepared” freak so I take a lot of gear so I need a big bag. You may not need a big bag this big for your application. If you search “Vinyl Cargo Bags” on Amazon there will be a lot of choices for you to pick from. Not all side by sides have a utility bed. Machines like the CanAM Maverick, Polaris Razor and similar models have small cargo decks or bays. You should be able to find something that will work. You might be wondering, “What if I buy one these bags and it gets a hole in it?” No problem. 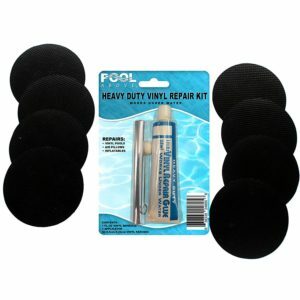 Just have one of these repair kits on hand. I got it at Amazon. They work great. However, theses bags are very durable and I seriously doubt that you will have any trouble with holes for a long time, unless you poke it with something real sharp. 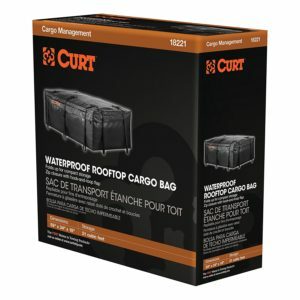 If you are looking to take along some gear on your side by side then I would highly recommend that you check into one of these cargo bags. They work real well and I am confident that you will be happy with the results.